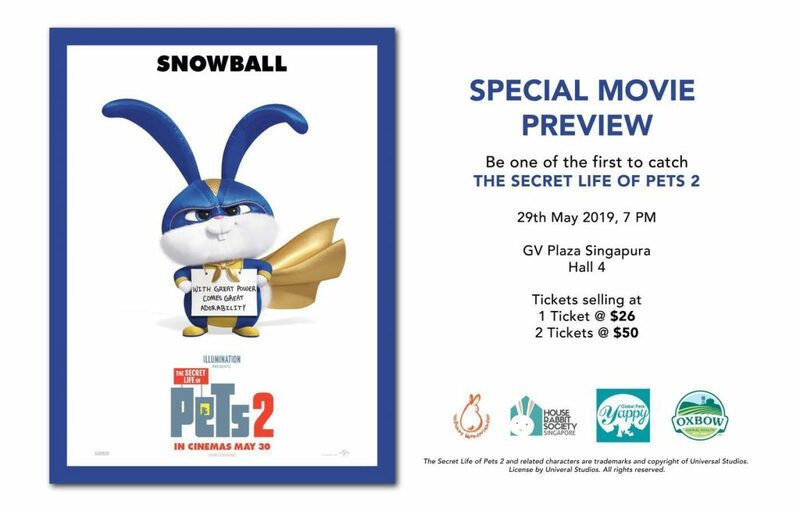 House Rabbit Society Singapore (HRSS) and Bunny Wonderland are excited to invite you to the “THE SECRET LIFE OF PETS 2” Movie Premiere’! Rabbit lovers will definitely be entertained by the super-adorable Snowball and there’s no better way than to enjoy it before it officially opens! Payment is expected to confirm your ticket purchase and you will be sent details on how to collect the tickets on the event day. There will also be a wonderful goodie bags for everyone! All proceeds will go towards our rescued rabbit and we hope you will join us! For further enquiry, please email to betty@hrss.net. Thank you!